Town fans can expect another tight game on Saturday against Solihull Moors according to Ben Tyler, who covers the club for the Solihull Observer. The clubs have already met three times this season, drawing 0-0 at Solihull in the league and 2-2 at The Shay in the FA Trophy, before Solihull edged the replay 1-0. Solihull are second in the National League, with 22 wins, seven draws and nine defeats from their 38 games. Leaders Leyton Orient are only ahead on goal difference, but have played a game less. Tim Flowers’ side were rated at 40/1 with the bookies for promotion at the start of the season, so it’s no wonder Tyler speaks so glowingly about their campaign. “Solihull’s miraculous season continues, and with that comes greater attention from the national media as the unthinkable gets closer and closer to becoming reality,” he said. “Other than a disappointing exit to AFC Telford United in the FA Trophy quarter-final, and the 2-0 loss away to promotion rivals Salford City, Moors have remained consistent with their results and keep grinding out the vital points that keep them propped up at the league summit. Tyler reckons Saturday’s clash could be a nervy affair. “Another tight game, as with the three previous encounters in the National League and FA Trophy,” he said when asked what Halifax fans can expect. “Add in the extra pressure on Solihull to get a result away from home, against a tough opponent, with just eight more games to play to try and pip Leyton Orient in top spot - and you’ve got a “one goal will edge it” kind-of-game on your hands. “In some ways. considering the approach taken by Tim Flowers to Moors’ shock title charge, there is no pressure on the players considering the expectation levels at the start of the season. Solihull’s four main strikers have plundered 38 league goals between them this season. 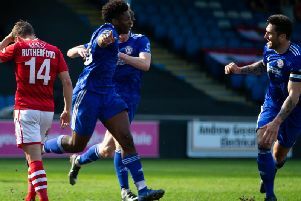 “The front line - which is usually comprised of three names from Jermaine Hylton, Danny Wright, Nathan Blissett and Adi Yussuf - seem to take it in turns to get on the scoresheet in each of their games,” said Tyler. “Some weeks, Yussuf will be the main man, other weeks Blissett will be the difference, and so on. “Jamey Osborne - a player Flowers refers to as the “best player in the division” - has been a vital cog in the Solihull machine this season and is at the heart of most good things Moors do going forward. Tyler says the approach taken by Moors has rarely differed throughout the campaign. “Flowers is very up-front about the way his side plays, with Moors viewed very much as a high-intensity side that like to get the ball forward quickly. Tyler said the only injury concern appears to be Osborne, who missed the weekend’s win over Braintree Town - but it’s expected that he’ll return to the team in time for Saturday. Other than that, Flowers should have a full-strength side available to him. Moors are likely to line-up with the following in a 4-3-3 formation: Ryan Boot, Lee Vaughan, Liam Daly, Alex Gudger, Jamie Reckord, Kyle Storer (c), Darren Carter, Jamey Osborne, Nathan Blissett, Danny Wright, Jermaine Hylton.